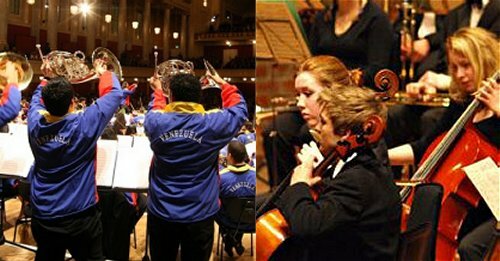 A very talented Venezuelan youth orchestra comes to a prestigious British venue. The Teresa Carreño Youth Orchestra (left) plays its socks off in a Russian symphony, receives rave reviews from all the leading London critics, is broadcast on primetime BBC Radio 3 and receives more sticky buns from the programme's presenter than can be comfortably digested. A very talented English youth orchestra comes to a prestigious British venue. The Suffolk Youth Orchestra (right) plays its socks off in a Russian symphony, no leading London critics are present. Advice to Philip Shaw and the Suffolk Youth Orchestra - change your name to the Felipe Seguro Youth Orchestra, invest in some national costumes and ink a deal with Askonas Holt. Thank you so much for saying this. It's very difficult to express this view publicly without being accused of failing to appreciate the achievements of El Sistema and these inspirational young Venezuelan musicians. But it doesn't detract from the magic of what they do, to point out that top-class, socially and educationally diverse Youth Orchestras exist in the UK too - and that they rarely get a fraction of the media attention. If the "Sistema" model teaches us anything, it's that results of this quality can only come from a grassroots movement, rooted in the specific community it serves. Many of the UK's county and regional youth ensembles continue to do just this - in the face of all manner of social and economic pressures. The UK HAS a "Sistema" already - albeit one battered by the decline in instrumental teaching and public awareness of amateur music. I've an interest to declare - I manage one such Youth Orchestra, drawn from a wide membership that reflects the full social range of the city it serves. (I'm sick to the back teeth of the inaccurate stereotype - unstated but implicit in so much media coverage of the Venezuelan youth orchestras - that UK Youth Orchs are exclusively the preserve of white, middle-class, privately educated young people). In nearly a decade of inspirational, top-notch achievement, we've had precisely one national press review. It wasn't ever thus. In the 80s and early 90s, my then Youth Orchestra (based in the North West) reguarly received reviews in the national press. Clearly, the world has changed since then in many ways. But we do, nationally, seem to have put youth and amateur music in a discrete box labelled "no serious artistic value". Unless, of course, it comes from the other side of the world with a lively back-story. Meanwhile - as the whole musical world (rightly) fetes the Bolivar and Carreno youth orchestras - earlier this year, Britain's National Association of Youth Orchestras spluttered out of existence. Of national music critics, only Tom Service (to his credit) even bothered to point this out at the time.